My Memory of Us is a game developed by Juggler Games and soon to be published by IMGN.PRO, both of them Polish companies. The game is set in a fantasy version of WWII, where two kids who are best friends are separated when an evil king (with robots) comes to power. They impose harsh restrictions on one of the kids (the girl) forcing them to wear certain clothing, mocking them, and creating dangerous situations. They only want to play together, and only by working together can the kids reveal their true power. 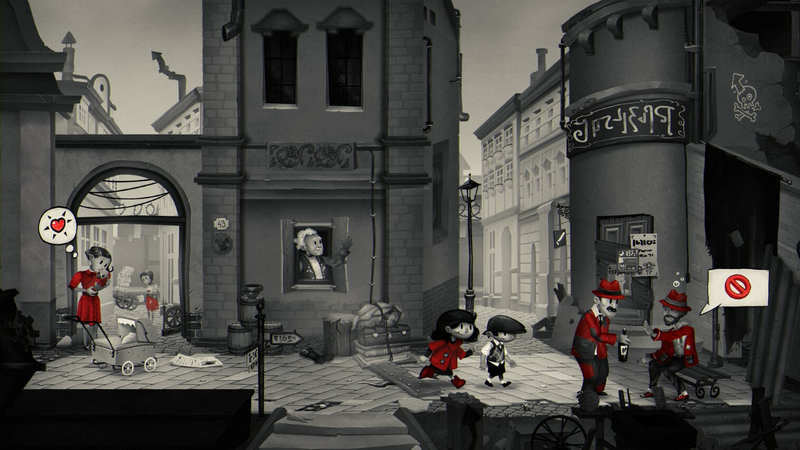 The game uses cute graphics against black and white dystopian steampunk backdrops of ghettos, garbage, and barbed wire. The story is narrated by Patrick Stewart. I'm happy that they are not directly using Holocaust imagery, since this tends to end up in the hands of Nazis who enjoy watching Jews lose the game (like they enjoy watching Holocaust movies and rooting for the bad guys). I don't know exactly how the story plays out. It might be an apologetic for Poland: the main characters are obviously the bad German regime and the two kids, Polish and Jewish, who work together and are both victims. Or it might not. You could gloss over that and simply enjoy the game. Apparently, the game was inspired by the real lives of some of the developers.